to guide every student, reinforcing the techniques. at SLL on a typical Saturday morning in Saigon, Vietnam. "Erik is a high-level grappler and passionate about teaching/sharing techniques. have met him and to now call him a friend!" IS SUBMISSION GRAPPLING EFFECTIVE? Submission grappling is a highly practical form of self-defense which has been proven in the context of mixed martial arts competition and fights around the globe. Submission grappling is a style of combat focused on bringing down and controlling one's opponent on the ground by using leverage, body weight, frames, and balance. While retaining control, the practitioner will use a finishing technique such as a choke or joint lock bringing the match or fight to a close. and assistance to beginners. Training here is a really motivating experience." ​HEAD COACH: Erik Koehne began teaching in 2010 and founded Saigon Luta-Livre (SLL) in 2012. He taught full time Brazilian Jiu-Jitsu (Gi & No-gi) in Saigon, Vietnam from May 5th, 2012 through December 14th, 2018, growing the club from 0 to about 100 students. SLL continues to serve Saigon today through 2 affiliate gyms under Erik's direction. They are operated by his students Adams and Tuan. Coach History: Erik started martial arts at Fairtex in San Francisco the summer of 2006 where he practiced Muay Thai and boxing. His instructors were Jenna Castillo, Jongsonan, Gangao, and Taraq Azim. By the middle of 2007 he began Fairtex’s Brazilian Jiu-Jitsu & MMA program with professional MMA fighter Alex Serdyukov, AKA: "The Russian Crusher". In late 2008, work brought Erik to the South Bay where he started training under top ranked Luta-Livre fighter and MMA professional Leopoldo Serao who remains his coach today. 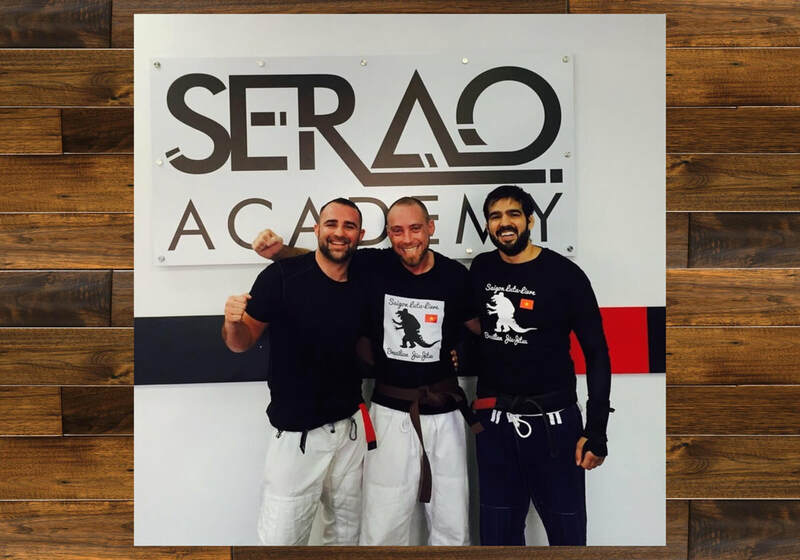 Serao has a vast understanding of both Brazilian ground fighting traditions, Luta-Livre and Brazilian Jiu-Jitsu (LL & BJJ). Erik teaches BLL and BJJ viable for all body types. He stressing the virtues of pressure, patient control, and high percentage finishes which can be used effectively by young & old, weak & strong. He presents subject matter is an easy-to-understand fashion. approach to the Luta Livre method.. If you are experienced of new to ground martial arts..
​I would highly recommend checking out SLL. Gi, traditional uniform worn by martial arts practitioners such as Karate or Judo. BJJ Gis are made most similarly to Judo Gis. They are different in that they are less baggy, or more streamlined. A Gi consists of a jacket, pants, and belt which is tied around the jacket. Grappling, fighting genre which includes subset styles such as Brazilian Jiu-Jitsu, Luta-Livre, Judo, Greco-Roman Wrestling, Free-style Wrestling, Folk Wrestling, Sambo, as well as other hand-to-hand, non-striking, non-weapons fighting styles. MMA, mixed martial arts. The overwhelming majority of professional MMA fighters are experts in at least one of the following arts: submission grappling, wrestling, kickboxing, and boxing. Most MMA superstars are experts in 2 or more. SLL, shorthand for Saigon Luta-Livre Grappling. SLL Grappling is now headquartered in Rocklin, CA. We have three affiliated clubs in HCMC, Vietnam.